When the highest Catholic spiritual leader promotes an historic Franciscan evangelist and colonist, it hits home for Jews too. Many of today’s Native Americans and Jews are in fact survivors of the same Catholic program. Yay! The Pope wants to stop the destruction of the Earth. Awesome! He even referred to the Earth as “her!” Great! Boo! The Pope intends to canonize Junipero Serra the friar who evangelized and colonized California. 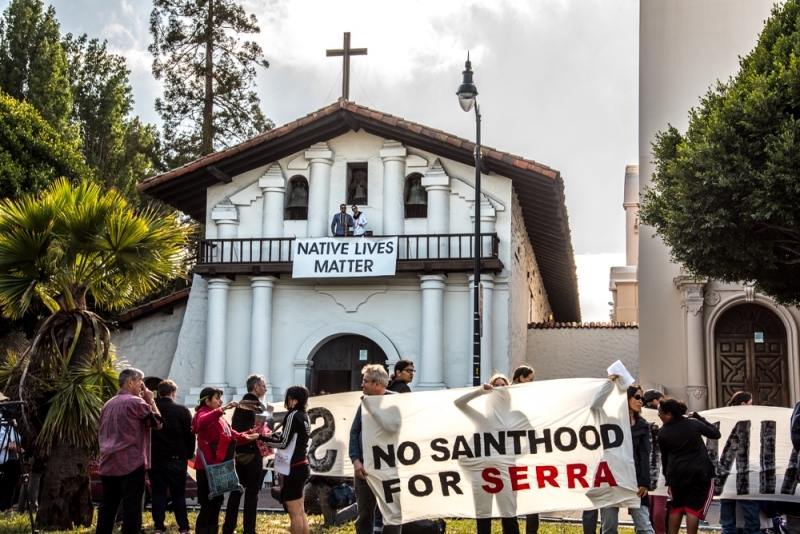 Native Americans across California, many who are practicing Catholics, are protesting the Pope’s plan but Catholic institutions have already been celebrating, such as Pontifical North American College and the Archdiocese of Los Angeles. The cause for his canonization was first introduced in 1934. Pope John Paul II declared Father Serra “venerable” in 1985. Three years later, the pontiff accepted a miracle worked through Father Serra’s intercession and beatified him. Another miracle was needed to declare him a saint, but, to the surprise of many, Pope Francis waived the requirement due to the widespread acknowledgement that the priest had lived an exemplary life. In 1987, “Serra’s remains were exhumed from a crypt below the Carmel Mission Basilica as part of a process called ‘canonical recognition,’ and several bone fragments were removed,” reported Mark I. Pinsky for the Los Angeles Times. 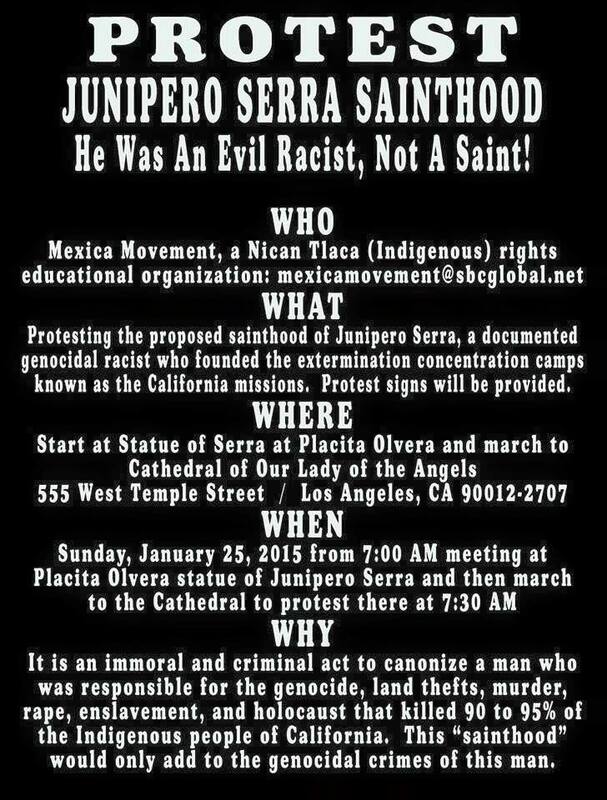 Yet mass graves of indigenous peoples remain beneath numerous of the missions that Serra founded. Serra’s legacy is of forced conversions, institutional abuse, slavery and cultural genocide. 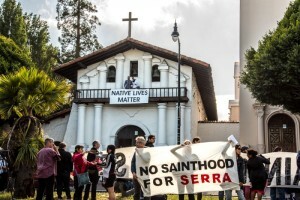 Native Americans across California have been resisting the canonization of Serra for decades. This year’s protests have taken place in public spaces and through social media campaigns. 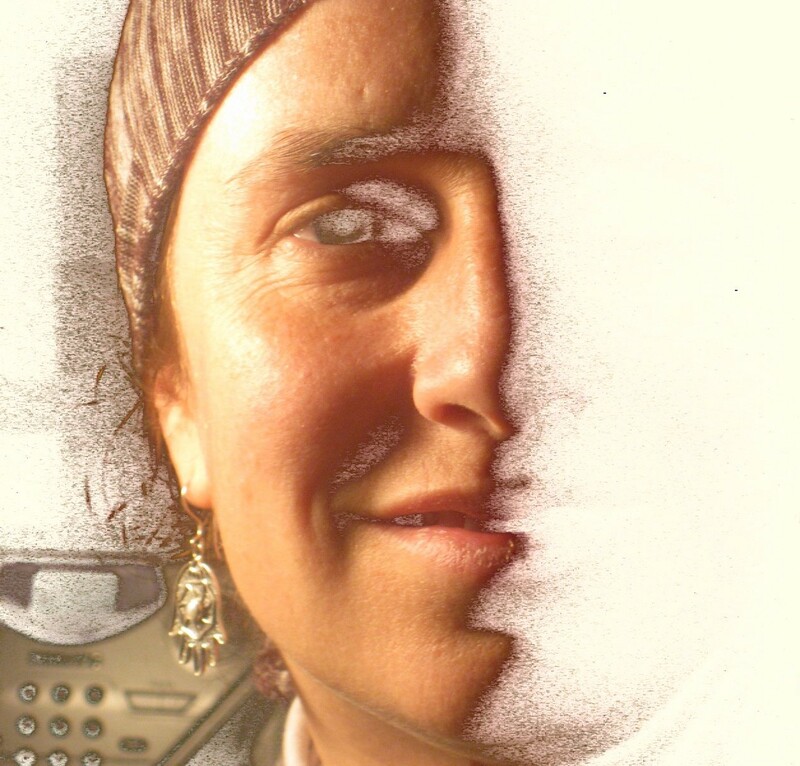 An article by Deborah A. Mirandah from January 2015 recounts the history of Serra’s crimes and the consistent protest from the indigenous community of the sainthood. Many opposing the canonization draw the parallel between the genocides of the Native Americans and the Jewish Holocaust, but the connection is much closer. The Inquisition was overcoming Europe since the early 13th century and reached Spain in 1481. Thousands of Jewish conversos were put on trial, imprisoned, or burned at the stake, culminating in 1492 when Spain expelled the Jews. That year, Columbus wrote in his diary on his first voyage to the New World, “Thus, after having turned out all the Jews from all your kingdoms and lordships, in the same month of January, your Highnesses gave orders to me that with a sufficient fleet I should go…” Franciscan missionaries traveled to the Americas with Columbus on his second voyage in 1493, under an order from the Spanish Crown to convert the Native Americans and colonize the New Spain. Columbus’ longterm goal was to finance the liberation of Jerusalem from the Muslims and make it Catholic. Two centuries later, Serra brought the Spanish Inquisition beyond New Spain and built missions along the West Coast of what is now California. 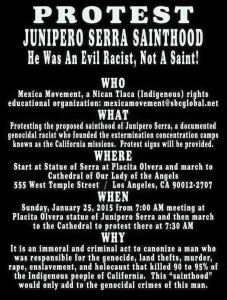 Serra’s genocide was continued by the capitalist gold miners and by 1870, 90% of the indigenous population in California was gone. The Catholic Church has a history of oppression against many cultures, not only those that are Jewish and Native American. The Inquisition swept across Europe, through Spain and Portugal to North, Central, and South America, and through Asia. The Church holds artifacts from many peoples globally in the Vatican Museums, including many sacred objects. 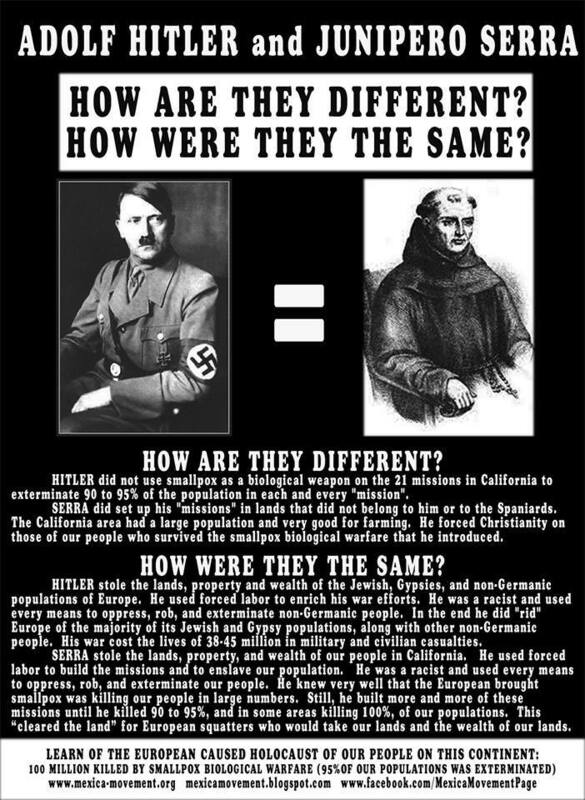 But Jews and Apaches were lumped together in a conspiracy theory that Father Charles Polzer, the Curator of Ethnology at the Arizona State Museum, announced around 1992 with regard to a movement to protect sacred Apache land from an international observatory that the Vatican was a part of. Today, the same Apache community that continues the struggle to protect Mount Graham is fighting to save Oak Flat ceremonial sacred site, which was given over to an international mining company in a last-minute addition by Senator McCain to the National Defense Authorization Act in December 2014. Congressman Grijalva introduced the Save Oak Flat Act on June 17, 2015, to repeal this capitalist government abomination. California indigenous communities are currently working to change the State’s educational curriculum to include the true history of genocide and promotional campaign posters include strong imagery, such as missions burning as is part of the story. At the same time, a long-time effort to ban the use of the name “Redskins” for school mascots has been moving through the California State government. To support indigenous rights, historically and in the present, Jewish people can take our lead from the native community. With regard to the Pope, Jewish people can be sure to include these important messages on indigenous rights and racism in our environmental justice advocacy. Jewcology blogger Jesse Glickstein is right, that Rabbis should learn from the Pope to take a stand on climate change. We must also broaden the conversation. When we talk about ecological debt, we must include the present and past history of plundering the Earth at will that Pope Francis describes, which ultimately includes the victims of Serra’s brutality and his influence on the continuing genocide particularly against the original peoples of California. A fantastic article. I hope there are many more like it. Kevin made connections I had not previously noticed.